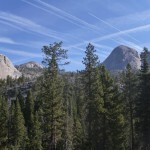 Starr King and Clark are near Half Dome, south of Yosemite Valley. 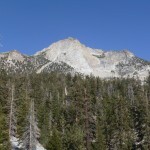 Clark is at the northern end of a ridge extending south to Merced Peak, while Starr King is the highest of a separate group of three domes. 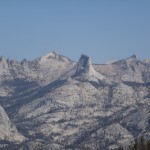 Starr King is distinguished by having no way up easier than 5.0 (though it was first climbed in the late 19th century), while Clark has two classic 4th class ridges, both similarly old. 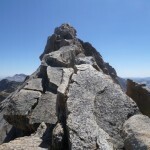 I had started to do these peaks two days after the Kaweahs, but quickly realized I was physically and psychologically fried. After some time off, I gave them another shot. 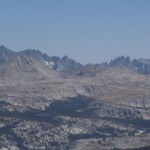 Though I started with ambitious plans to traverse south to Gray, Red, Ottoway, and Merced Peaks, I underestimated how long it would take to hike from Starr King to Clark, and wasted some time on spicy route-finding errors, so I only tagged the first two. 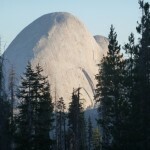 A complete traverse from Clark to Merced, optionally including Half Dome and Starr King, would be a fairly serious day. 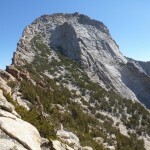 However, because the peaks are so low, much time is spent dealing with vegetation, so the traverse might not be fun. 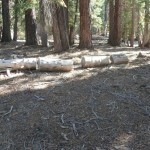 The Mono Meadow trailhead is apparently a safe place to sleep in your car in Yosemite — at least, I didn’t get tooled. I slept in and took my time getting ready, but even my late-ish 6 AM start required a bit of headlamp time this late in the season. I made my way through the familiar trail-maze, then headed east toward the gap north of Starr King. I began having to deal with shrubbery here — both the spined and spineless varieties, but was mostly able to either find game trails or stay in the woods, where there was less undergrowth. 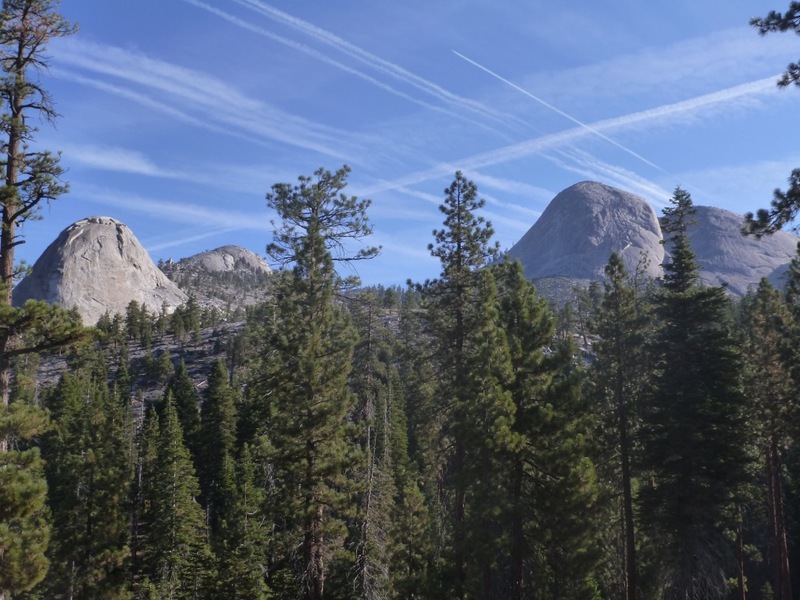 I found what looked like an old trail on the steeper, overgrown hillside leading to the Starr King domes, then followed the right-hand side of the valley to near the saddle. After a “warm-up” session on some steeper slabs too far west, I had enough confidence to waltz up the standard route in my running shoes. 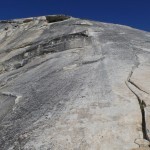 (Slab soloing requires knowing how your shoes and the rock interact, and having an eye for subtle rough spots and subtle changes in angle, but it’s mostly about confidence.) The route follows a corner for awhile, then traverses across a blank slab to a crack, which it follows to another corner and flatter ground. I mostly jammed the edge of one shoe in the crack and walked up, but added a few hand-jams where the crack was clear of debris. 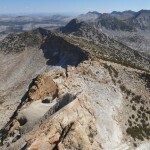 From the summit, I tried to plot a route to Clark’s northwest side. 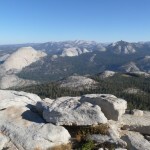 The terrain between the two peaks consists of rolling forest with sand-and-slab islands. I eyeballed a route heading east then southeast, connecting several islands and roughly following a ridgeline. Descending the southeast side, I went too far west, then saw a big rap station and corrected my course. My route was fine, except that some animal with what turned out to be terrible-smelling pee had copiously moistened an important hand-hold. After an annoyingly brushy descent and some easy woods, I reached the first sand-island on my route. While the ground was mostly the standard, annoying, collapsing stuff you find off-trail in Yosemite, at least I could see where I was going. 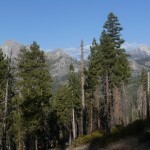 Except for one time when I deviated from the ridge and got into some dense forest, my route went well. However, Starr King and Clark are quite far apart; while Bill Bryson might have enjoyed it, this walk in the woods became frustrating after the first couple of hours. 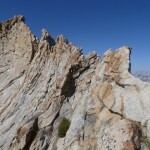 Since it is only 10,500′, the rock-climbing part of Clark’s northwest ridge is fairly short. 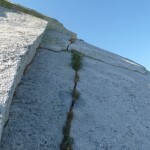 I ignored the route description, staying on or near the ridge until faced with either a few friction moves on kitty-litter granite, or an awkward squeeze chimney. I traversed right into a gully, then headed back up some cracks toward the ridge. In retrospect I should have done the obvious thing, i.e. followed the gully until it got closer to the ridgeline. After much wasted time and one sketchy dynamic move, however, I made my way work, reaching much easier climbing on the crest of the ridge below some very long rap slings. More easy, exposed scrambling led to the summit. Looking at the ridge to Gray, I was discouraged to see that much of it consisted of the slow brush-and-boulders mix I had found on the way up to Clark. 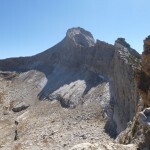 Given the amount of time I had already wasted on extracurricular climbing, I decided to simply descend the southeast ridge (for variety) and head home. 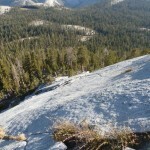 Clarence King made a famous, and famously-unnecessary, jump on the first ascent of this ridge, which is mostly near enough to the sandy east slope to allow an easy escape or bypass. I was a bit more sporting, but went nowhere near the jump. The descent, following the westerly ridge south of Clark, was mostly easy until I reached the woods near the various forks of Illilouette (a small, disease-bearing lark? Pluck it!) Creek, where deadfall made things unpleasant. Taking the easiest path north of the creek, I eventually found the trail, where I turned on a podcast and put on a myself on autopilot back to the trailhead. I keep hearing about this jump but never saw where it needed to be done. 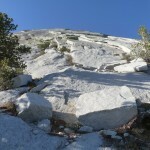 One stiff down climb and I was on ledges that took me all of the way to the notch. Same here. It looked like there were some gaps you could jump if you stayed right on the ridge, but I didn’t see anything obvious, and certainly nothing necessary.